The National Science Foundation (NSF) has awarded Southern Illinois University Edwardsville a $204,565 grant through its Major Research Instrumentation (MRI) program for a project under the direction of principal investigator George Engel, PhD, professor in the School of Engineering’s Department of Electrical and Computer Engineering. The award supports Engel and his graduate students’ research involving the development of custom microchips that are used in experiments conducted by physicists from Washington University, Texas A&M, Florida State University, and several other universities. The integrated circuit design conducted in Engel’s research lab involves extremely detailed work that results in the creation of tiny, yet powerful, microchips that are approximately 5x7 millimeters in size. The chips are capable of replacing huge racks of electronics that used to be required to conduct these types of experiments. “This is a two-year grant, that really has three parts,” Engel explained. “We have promised to add features to two existing chips that we previously created. 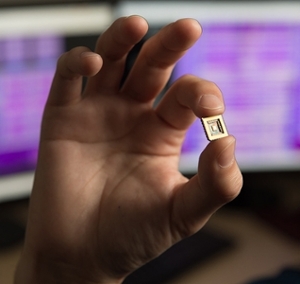 One chip, able to identify the type of radiation being detected, can be potentially used in handheld radiation monitors for first responders. The second allows physicists to obtain extremely precise energy measurements. It can count as little as 3,000 electrons. As a teacher-scholar, Engel consistently involves graduate students in his research and instrument development activities. Currently, master’s candidates in the electrical engineering program Bryan Orabutt, of Springfield, and Pohan Wang, of Taiwan, are involved. Their hands-on experience will make them highly prepared for the professional industry upon graduation. The design and fabrication of the microchips involves complex attention to detail and hours of careful work. According to Engel and his graduate students, the work fits their passion for electronics, with the added bonus of having a significant impact on research and development. 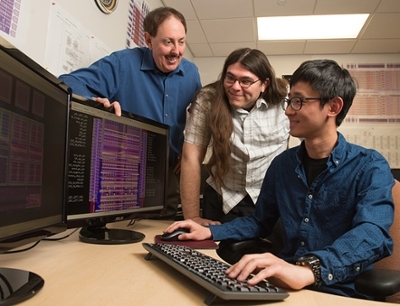 Photos: SIUE Graduate student Pohan Wang, of Taiwan, is seated in the research lab, with fellow student Bryan Orabutt, of Springfield, and Dr. George Engel (back), looking on. A close-up of one of the microchips Dr. Engel has created demonstrates its size.